But for the outsized guitar fixed to the street lamp outside, Sun Studio doesn't impose itself on passersby, really. The floors creak in places. The equipment doesn't have that expensive L.A. studio shine. It can get cramped fast thanks to the visitors from around the world who've come to see it, too—the recording studio into which a young truck driver named Elvis Presley swaggered late on a Saturday night in the summer of 1953. You know the rest. Those early Sun recordings crackled with a manic energy, as the singer began his ascent to the stratosphere of popular music. Sun, to be sure, is not the most prominent Presley landmark in his hometown. In a matter of days, thousands of fans will descend on Memphis for "Elvis Week," a celebration Aug. 11-19 timed to the 40th anniversary of his death. A centerpiece event of that week includes a candlelight vigil outside Elvis' estate of Graceland—the second most-visited house in the U.S. after the president's. And this year the festivities will expand into the $130 million addition—a massive museum complex called Elvis Presley's Memphis—that opened this spring. 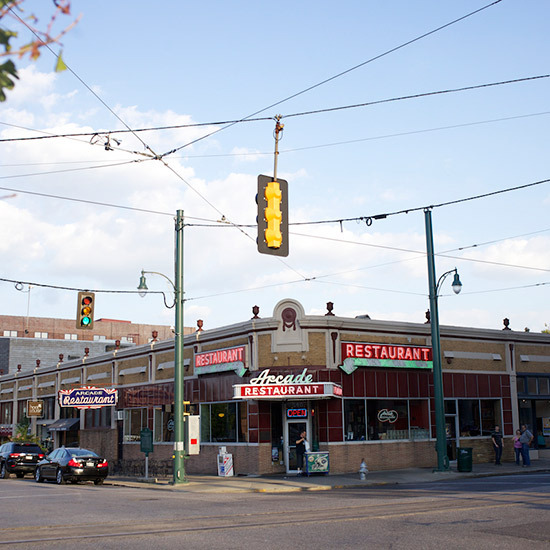 If music fans were so inclined, though, a handful of other sites in Memphis can also be stitched together for an Elvis Crawl—a more intimate tour of points of Presley-related interest that combines food and history for a singular music-themed experience. And you'd start at the modest building on Union Avenue. The first thing you notice after stepping inside Sun is how unremarkable the place feels. It looks less like a pop culture landmark and more like a physical artifact of a moment in time. You buy a tour ticket at the cash register as soon as you walk through the door. The cashier, when there's a break in the flow of customers, might start mindlessly strumming a guitar he picks up from behind the register, seemingly oblivious to the visitors gawking at the giant photo on one wall of the "Million Dollar Quartet": Elvis at a piano, with Jerry Lee Lewis, Carl Perkins and Johnny Cash watching over his shoulder. Records line the walls. A neon jukebox stands in one corner. You can sit at the counter and order things like ice cream sandwiches, coffee and canned sodas while waiting to start your tour. Don't overlook the strips of tape that still mark where Elvis would have stood in the studio itself, which sets up a punchline for the tour guides. One female visitor was so overcome, standing in front of the microphone where Elvis would have planted himself, that she supposedly licked it. Bob Dylan, when he came to visit Sun, dropped to his knees and kissed the ground. "Please don't lick the equipment," the guides like to ask visitors, "but you're welcome to kiss the floor." Next up is a 10-minute Uber ride to the west for a stop at The Arcade, which has been around since 1919. This is a classic American diner, the place to go for greasy comfort food—your basic "meat-and-three"—with fans overhead to counterattack the oppressive Southern heat. After walking inside, turn to the left and follow that row to the booth at the very end. That's where a pre-fame Elvis sat and ate, with his back to the rest of the restaurant. It's such a pedestrian thing, to think of the superstar in this blue-upholstered booth in a diner, as you listen to what he would have heard. Waitresses taking orders. The culinary cacophony from the kitchen. Harry Zepatos Jr., grandson of the Arcade's founder, owns the restaurant today and says Elvis would look up, like you can too, to the mirror to see if any fans maybe gathering behind him were about to make a scene. If he sensed they were, he'd make a quick dash out the door in front of you. For the full experience, order the fried peanut butter 'n' banana sandwich, just the way Elvis likes, the menu points out. Keith Richards is said to have described rock 'n' roll as music from the neck down. You can get a sense of that while taking in the surroundings at Catherine & Mary's, a Downtown Memphis restaurant from James Beard Award-nominated chefs Andy Ticer and Michael Hudman. The first time the world heard Elvis' landmark recording "That's All Right Mama" was when it was broadcast from inside this building. The wild, lightning in a bottle disc jockey Dewey Phillips—with catch phrases like "Get yourself a wheelbarrow load of mad hogs, run 'em through the front door, and tell 'em Phillips sent ya! 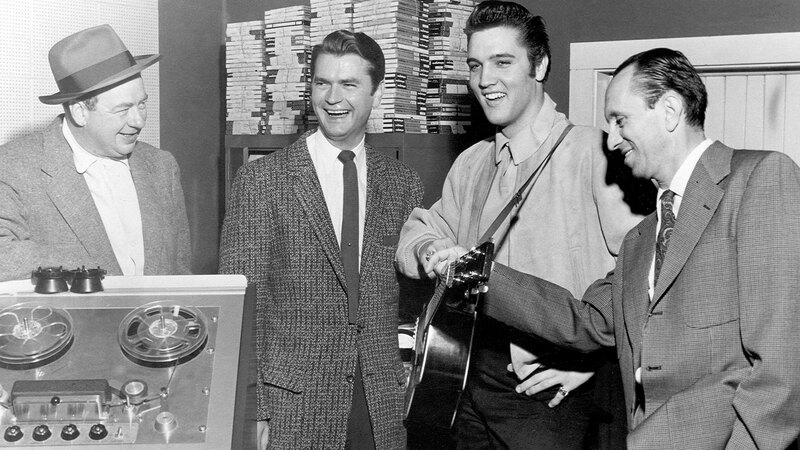 "—used his "Red, Hot and Blue" radio program to introduce Elvis to the masses. Things are, of course, a bit more subdued inside today. "The style of cooking at Catherine & Mary's," Hudman says, "really relies on our grandmothers and what we call grandma cooking. 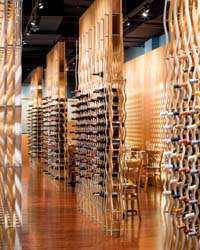 It's all about using the best ingredients to create something that fulfills the body and soul. We really believe that food should tell a story about where you come from and where you're going." While enjoying the dinner menu that includes entrees like halibut, lamb and pork, you might also find yourself coming to understand why, when an interviewer once asked Elvis what he missed about his hometown, the singer replied, simply, "Everything."